An 80-bedroom, luxury hotel in the City of London, South Place Hotel is the first hotel from restaurateurs D&D London. Designed by Allies and Morrison, with interiors by Conran and Partners, it's one of the most stylish hotels in East London. 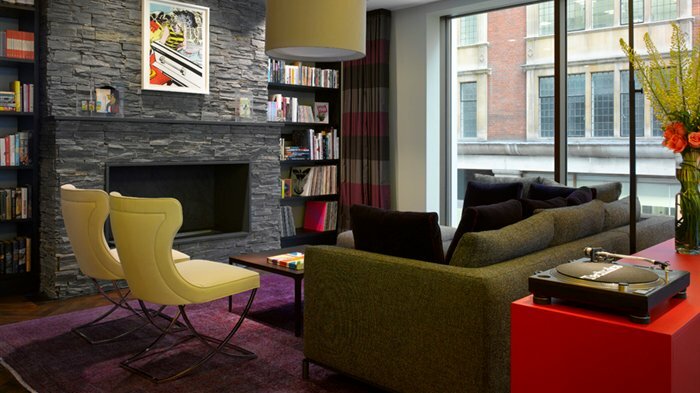 Stylish Allies and Morrison designed hotel with interiors by Conran and partners. Located within arms reach of both Moorgate and Liverpool Street stations, is South Place Hotel, a luxury London hotel featuring three swanky bars and two top-notch restaurants. With newly furbished interiors designed by none other than Terrance Conran, the hotel boasts 80 deluxe bedrooms as well as five private dining and meeting rooms for those planning to do a bit of business. The first hotel from restaurateurs D&D London - who took on the Conran group of restaurants and now own some of London's best restaurants including Skylon in the Southbank Centre, Le Pont de la Tour at Tower Bridge, and Bluebird Cafe on the King's Road - the hotel's own Angler seafood restaurant and rooftop terrace and 3 South Place Bar & Grill live up to the hip reputation of the Shoreditch neighbourhood. Angler restaurant on the seventh floor of South Place Hotel offers diners views of London's iconic skyline. A quintessentially British seafood restaurant overseen by Tony Fleming, previously Executive Chef at One Aldwych, the menu focuses on seafood and shellfish from across the British Isles and is complemented by a wine list of around 250 bins. In the far corner of the restaurant, the private dining room commands spectacular views of City landmarks, including the Gherkin and Tower 42. Outdoors, the rooftop terrace is a City hot spot, especially in spring and summer. British diner open seven days a week from breakfast to night. 3 South Place is a British diner, open seven days a week for breakfast and throughout the day and into the night. With accessible price points and classic British comfort food, the restaurant is aimed in equal measure at hotel guests, City customers and East End neighbours alike. Next door, 3 South Place Bar features distinctive cocktails, a great selection of wines and Champagnes by the glass, and after-hours DJs. A gym, wellness centre and treatment room can be found on the first floor of the hotel. South Place Hotel has partnered with Aromatherapy Associates, who work with the world's finest hotels and destination spas, to provide treatments in the dedicated treatment room on the first floor of the hotel. The adjacent gym and wellness centre also offer Technogym equipment - the company used by football clubs like Manchester United and AC Milan, and McLaren and Ferrari - as well as steam rooms and a sauna so travellers can rest after a weary day in the city. On Sunday afternoons a one-hour yoga class is led by Jessica Skye, founder of Fat Buddha Yoga, equipment provided and all levels welcome. From cheap budget hotels to luxury 5 star hotels see our special offers for hotels, including Grange Holborn Hotel London from 56% off.